My husband and I are frequent flyers, but Delta’s recent major malfunction with their computers hasn’t made me excited to travel by airplane these days. Say what you will about driving long distances with young children, but I still prefer to be somewhat in control of my travel plans. Whenever possible, we choose to drive to our destinations in our SUV. 1) Ditch the Routine: Routine is critical for raising young children. At home, my kids’ morning and evening routines are flawlessly executed so that I can tell exactly who is brushing their teeth and who has not completed their homework. Routine is a comfort for them and it keeps the machinery of the family well oiled. BUT, a road trip is no time to force a routine. No matter how noble your efforts, something will delay dinner or bedtime. Your kids may spend an entire morning watching television in the hotel room. They may sleep through lunch or drink milkshakes for breakfast (more on healthier eating in tip #2). Trust me when I say you need to GO WITH IT. Try as hard as you can to ignore the clock altogether (especially if you’re traveling through multiple time zones). Stressing about routine will only make your trip less enjoyable. I promise you that even several weeks on the road will not permanently disrupt your family routine. As soon as you are back at home, your kids will fall into their familiar patterns. 2) Don’t Get Hungry: We’ve all been there—it’s dinnertime on a road trip and everyone is cranky and hungry and there isn’t a restaurant in sight. The kids are fighting in the backseat and my husband and I are starting to turn on each other. After what feels like forever we find a gas station and load up on processed junk and sugar. Then we continue on, comatose and exhausted, no less annoyed with each other. To avoid this, buy a cooler or two and stock up on sandwiches, fruit, nuts, cheeses, and other healthy hand-held snacks. Purchase milk in single-serve cartons for the kids and invest in a large coffee thermos for the adults. Whenever you find yourself in a town with a grocery store, spend a little extra time buying food and getting it separated out into single servings before you get back on the road again. This seems like a lot of planning but it soon becomes second nature—and it’s so worth it! 3) It’s About the Journey: Sure, you probably have a goal in mind—whether it’s to visit the grandparents or see the Grand Canyon—but try to be open to possibility. I can’t tell you how many “detours” turned out to be more memorable or exciting trips that the planned destination. Tell you kids to be on the lookout for billboards offering interesting tourist stops and make sure to check out the pamphlets in any hotel lobby you might be staying in. 4) Talk the Talk: We sometimes forget that driving is a perfect opportunity to talk to our loved ones, and not only about the surroundings we happen to be traveling through. Rather that playing “I spy” or trying to keep my kids entertained every single second with the iPad or coloring books, I like to talk to them about their lives. Hypothetical situations are also fun or funny (you can play the “Would you Rather” game, i.e., “Would you rather eat a worm or touch a tarantula?”) especially with younger players. One of the thrills of my life as a mom is listening to my sons talk to each other. Older kids will naturally talk about their interests or their goals and it’s a great opportunity for parents to listen to them. 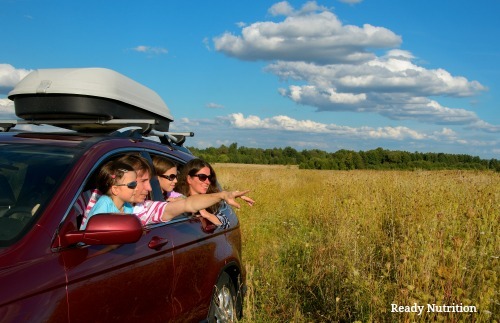 5) Carry the Closeness With You: Not to get too sappy, but family road trips definitely happen during a limited window of time. Try as much as you can to appreciate being in close quarters with your kids and attempt to maintain that connection long after the trip is over. Taking photos is very important, but to keep it even simpler you can have every family member talk about their favorite and least favorite parts of each day. Look for patterns in the trip (for example, one summer it seemed the radio was constantly playing “Staying Alive” no matter where we went) and encourage kids to collect keepsakes. Don’t fall into the trap of buying expensive souvenirs—a pretty rock or seashell work just as well. Once you’re back at home, that song or silly joke or seashell takes on the symbolism of the entire trip. Treasure it. Great article; with all the hassle of flying these days, we prefer the classic American road trip as well. Thank you. I like to splurge and rent a minivan with all the latest bells and whistles. It’s way cheaper than airfare for a family group and much more comfortable!The kids can watch a preselected movie, listen to their own playlist, check the GPS or just stare out the moon roof. You are def right on about the conversational opportunities which are much more private in a family car than a crowded plane or airport. Also, magnetic chessboards! I agree with your advice on routines as well and would apply this advice to the mealtime dilemmas as well. Don’t bother counting the number of fast food meals your kids are consuming on your trip. You’ll soon be home in your kitchen and making sure they are well nourished. We also use grocery stores for mealtimes as much as possible and take the opportunity to stock up on handy healthier snackage than you can find at any gas station. Cheaper too! Happy Trails!